It contains Neem (Azadizachta lndica) Cake and Satyanashi Cake in Powder Form. We are engaged in manufacturing of high grade quality Mount Neem Khad that is prepared from quality ingredients. This Mount Neem Khad acts as an insecticide and disease protector in soil as well as an Organic-Fertilizer giving increased humus content in the Soil. 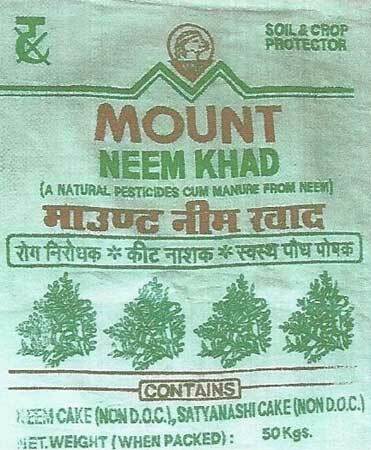 We offer Mount Neem Khad in proper packaging and at affordable price. Today, we are reckoned as a prime Manufacturer, Supplier and Exporter of Mount Neem Khad from India.